October 31, 2017 marks the 500th anniversary of the Protestant Reformation. It's a great opportunity to teach our kids a little history and highlight the key truths recovered during the Reformation. 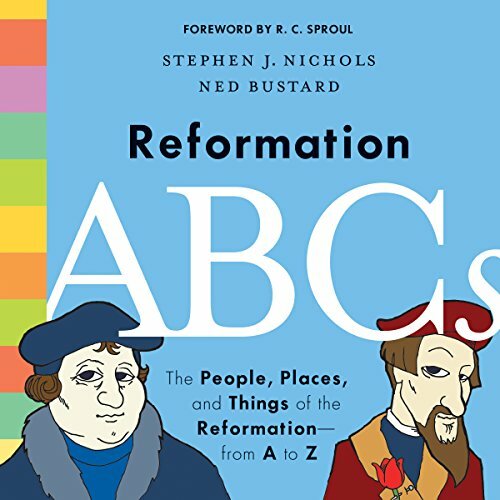 Just below, I've provided a simple summary of the Reformation written for young children adapted from "L is for Luther" in The Church History ABCs: Augustine and 25 Other Heroes of the Faith by Stephen J. Nichols, (Crossway, 2010). Then, after that, you'll find a list of party activities for celebrating the Reformation with young children. Martin Luther was just a regular person—like you and me, but he saw the world change in his lifetime, and he had a little something to do with it. When Luther was alive, many churches did not teach that people should trust only Jesus to be saved from Satan, sin, and death. Instead, they taught that people needed to do special works, touch special objects(like one of Peter’s teeth or the wood from the cross), or even pay money in order to be saved from sin (or have their family go to heaven). This is not what the Bible teaches. But there was another problem. When Luther was alive, people did not have Bibles in their homes like we do. The Bible had only been translated into one language, Latin, and this was a language most people couldn’t read. In the 16th century, Martin Luther and other men we call 'the Reformers' helped the church find its way back to the Bible and back to its message—the good news about Jesus. On Halloween night, October 31, 1517, Martin Luther posted a list of 95 things that needed to change on the door of his church in Wittenburg, Germany. People read what he wrote, and they began to see that the church had turned away from Jesus and his Bible. Soon (and with Martin Luther’s help), the Bible was written down in languages that common people understood. Very soon there was a whole movement of churches that believed salvation from sin and death comes only from Jesus. Bible Smuggling Relay — During the Reformation, it was illegal to print a Bible in a language that people could read. So, the Reformers often had to hide Bibles from church leaders and sneak them to the people so that they could read them. Activity: Divide kids into two teams. Have one representative from each team put on an oversized coat over their clothes. The representative for each team will try to carry a stack of books inside the coat. Then, the two representatives will race around a cone and back. Once the representative returns, he will put down the books and the coat, and the next child on the team will do the same. Children take turns carrying books in the coat around the cone until every member from one team has completed the relay. Diet of Worms (Snack) — Teaching that Jesus and the Bible are the only way of salvation got Martin Luther in a lot of trouble. He was put on trial before a group of church leaders (this trial was called a “diet”) in the city of Worms, Germany (pronounced “Verms”). For a treat, give the children a different sort of diet of worms, gummy worms mixed into a chocolate pudding/Oreo cookie mixture. Wittenberg Door —The Reformation started when Martin Luther hammered a piece of paper to the church door in hometown of Wittenberg, Germany. This was a list of 95 things that needed to change about the church. Activity: Prepare a large red church door out of butcher paper and hang it on a hallway wall. Then, label it Wittenberg Door. Prepare half-page coloring sheets with statements like “We are saved by Jesus alone,” “The Bible in our own language,” and “Jesus is all we need.” Then have the kids "nail" the statements on the door using tape or tacks. You may even consider allowing them to use a toy hammer. Pin the Beard on the Theologian — One of the great things about the Reformers is that many of them had really great beards (at least that's what Pat Aldridge tells me!) Play a game of 'Pin the Beard on the Theologian' (like pin the tail on the donkey). Activity: One at a time, each child is blindfolded and handed a paper beard with a thumbtack poked through it (or a bit of sticky-tac applied to the back). Spin the blindfolded child. Then, point the child to this picture of Luther that you've hung on the wall. The pictures are from blogger Molly Buffington, who reminds us that Luther did grow a beard when he was hiding out from Charles V! The finished product (a very well-aimed beard) will look like the photo below. Hope you have fun teaching kids about the gospel and its recovery by the church just a few centuries ago.